Welcome to the website of Ace Air Metal Fabrication, where "Great Service, Great Products at Competitive Pricing" are a standard. For over 38 years Ace Air Metal Fabrication has remained a premier provider of custom fabricated sheet metal products. Here at Ace Air Metal Fabrication, we believe in creating long lasting relationships with each of our clients. It is our foremost goal to continually exceed your expectations while also delivering superior products with exceptional and precise attention to detail. 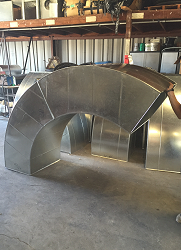 Whether you need a large-scale production or one-of-a-kind custom piece, we are your Northern California resource for all of your sheet metal needs. " If you can draw it, we will design it!" Below we have bulleted our residential and commercial/industrial sheet metal products. If you do not see what you are looking for, just let us know, we will be happy to assist you. 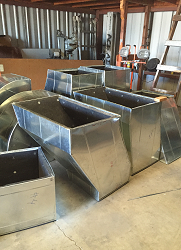 At Ace Air Metal Fabrication, our skilled sheet metal team can customize duct work, special fittings and much more. We are dedicated to maintaining superior quality control over every fabricated part so that it can be completed faster and more efficiently. We work with a wide range of materials including aluminum, stainless steel, PVC coated and more. No matter how complex or specialized a job is, our sheet metal experts will assure custom work done to precise standards from start to finish. We invite you to continue your tour of our website. 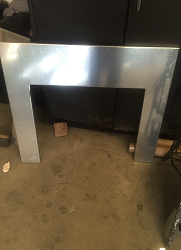 If you have questions or we can assist you in any way, please call Ace Air Metal Fabrication at 916-338-0132. Thank you for your interest in Ace Air Metal Fabrication. We look forward to serving you in the near future! Custom made orders per your design. Ace Air Metal Fabrication has been providing custom fabricated HVAC metal products to the Northern California area including the cities of Alameda, Albany, Antioch, Atherton, Auburn, Auburn Lake Trails, Bay Point, Belmont, Benicia, Berkeley, Bethel Island, Brentwood, Bret Harte, Brisbane, Burlingame, Byron, Cameron Park, Castro Valley, Ceres, Citrus Heights, Clarksburg, Clayton, Clyde, Cold Springs, Colfax, Colma, Coloma, Concord, Daly City, Danville, Davis, Del Rio, Diamond Springs, Dixon, East Oakdale, East Palo Alto, El Cerrito, El Dorado, El Dorado Hills, Elk Grove, Emeryville, Empire, Escalon, Esparto, Fair Play, Fairfield, Folsom, Foster City, Fremont, Galt, Garden Valley, Georgetown, Grayson, Green Valley, Greenwood, Grizzly Flats, Half Moon Bay, Hayward, Hercules, Hickman, Hillsborough, Hughson, Isleton, Keyes, Knights Landing, Knightsen, La Honda, Lafayette, Lathrop, Lincoln, Livermore, Lodi, Loomis, Madison, Manteca, Martinez, Menlo Park, Meyers, Millbrae, Modesto, Monument Hills, Moraga, Newark, Newman, Oakdale, Oakland, Oakley, Orinda, Pacifica, Patterson, Pescadero, Phillips, Piedmont, Pilot Hill, Pinole, Pittsburg, Placerville, Pleasant Hill, Pleasanton, Pollock Pines, Portola Valley, Rancho Cordova, Redwood City, Richmond, Rio Vista, Ripon, Riverbank, Riverdale Park, Rocklin, Roseville, Sacramento, Salida, San Bruno, San Carlos, San Francisco, San Leandro, San Mateo, San Pablo, San Ramon, Shingle Springs, South Lake Tahoe, South San Francisco, Stockton, Strawberry, Suisun City, Tracy, Turlock, Twin Bridges, Union City, Vacaville, Vallejo, Walnut Creek, Waterford, West Modesto, West Sacramento, Westley, Winters, Woodland, Woodside, Yolo and the surrounding areas.